Bande Virgil, MD is a board certified pediatrician with several years of practice in private settings and hospital-based medicine, as well as medical missions abroad. 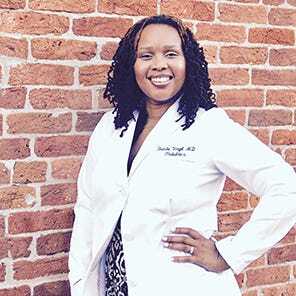 Dr. Virgil has a strong commitment to her family, married with two young children. She's also a writer and public speaker who is committed to normalizing the experiences of parenting, discussing the challenges, offering hope and solutions in her powerful words. "I am committed to improving the lives of children in my community. Despite all the advances in medical care we have made in this country, poverty and disenfranchisement exist in communities like mine. We are far enough away from a major city, that when children here get sick it presents a real crisis for families. I am committed to providing high quality pediatric care to this community so that parents don't have to get their children transferred hours away, forcing them to miss more days of work and separate from their family support. Our county has a very high rate of poverty and child abuse (often correlated), so part of my job as pediatric hospitalist is helping the families of my patients get support and resources, and ensure safety. I am an advocate in our community as part of the GA Project Launch which is addressing mental health needs in children Muscogee County as well as other areas in Georgia with a multidisciplinary coalition of physicians, social workers, mental health professionals." Click here to visit Dr. Virgil's parenting blog.